UCSC alumnus Kevin Beggs, the president of Lionsgate Television Group, gave the keynote address for a two-day film symposium, Bridging the Gap, hosted by the Arts Division last summer at UC Santa Cruz. 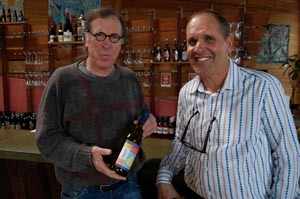 Six months ago, UC Santa Cruz dean of the arts David Yager met renowned local winemaker and UCSC alum Randall Grahm at the Coffeetopia café in Santa Cruz. Over countless cups of coffee, the two hatched a plan for Grahm’s Bonny Doon Vineyard to develop specially bottled wines with custom-designed labels by UCSC art students. Part of the proceeds from these wines would go to supporting UCSC arts scholarships. A call soon went out to UCSC art students to submit design ideas for the first vintage. 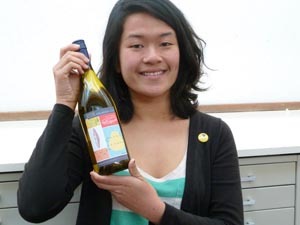 Art major Louise Leong created the winning image for the 2010 Banana Slug Roussanne white wine. She is also a staff illustrator for the campus’ student newspaper, City on a Hill Press. 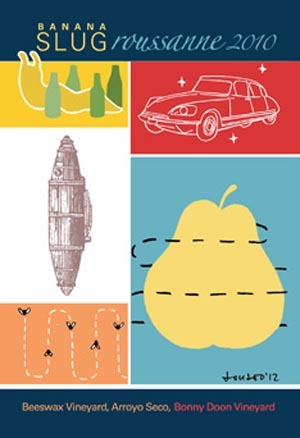 Leong’s brightly-colored label includes images of honey bees, plus the winemaker’s signature red Citroen automobile. The official launch of the new wine is April 30. To celebrate the release, the Bonny Doon tasting room will host an exhibition of original artwork by all three of the runner-up UCSC student artists. The partnership with Grahm is just one of the many efforts Dean Yager has made since his arrival in 2009 to reconnect the UCSC Arts Division with alumni, the local, and the not-so-local community. His efforts appear to be paying off. 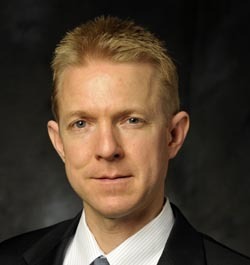 Last summer the campus hosted a Film and TV symposium, bringing in Kevin Beggs, a UCSC alumnus who is president of Lionsgate Television Group as keynote speaker. Guest panelists included a bevy of UCSC alums who are now major players in the entertainment industry. 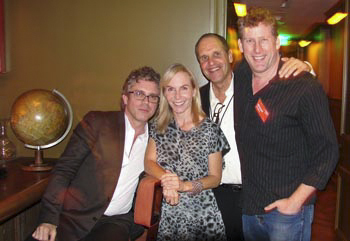 Yager followed that up in the fall with a fundraising evening held in Los Angeles for UCSC alums in film and TV, hosted by Brannon Braga (Star Trek, 24, Terra Nova) that was a big success. Braga is also a member of the new Arts Dean’s Leadership Board that Yager has created. Other participants on the advisory board include director Sheldon Epps (George Lopez, Frasier, Friends), producer Ron Yerxa (Little Children, Little Miss Sunshine), Rhino Films CEO Steve Nemeth, executive producer Brian Kavanaugh-Jones (Take Shelter, Insidious), and Kikim Media CEO Kiki Kapany. At the LA event, the dean presented award-winning writer and producer Marti Noxon (Mad Men, Grey’s Anatomy, Glee) with the first UCSC Film & Digital Media Prestigious Alumni Award. Afterwards, Noxon said she came away with “a renewed desire to support the Arts Division at UCSC,” and has since collaborated with the dean on fundraising outreach to film and TV alumni. Yager also encouraged the LA group to think about supporting vital new initiatives for the UCSC Arts Division that he characterized as "game changers"--including a named School of the Arts, the University Museum of the Arts and Sciences, and a new film building. The dean said he is currently about to begin advertising to hire a director for the museum, to enhance planning and fundraising efforts. “Conceived as an ‘institute of curiosity,’ this museum will invite viewers to explore objects, images and ideas from across the disciplines,” said Yager. “More than a museum, it will operate as an intellectual hub for visiting faculty, UCSC faculty, and artists in residence, and will provide space for everything from site-specific installations and experiments in scientific visualization, to seminars, events, and hands-on research,” he added. An Arts Dean’s Lecture Series titled “Reshaping the Museum” will kick off at UCSC on April 12 to help the campus begin thinking about the project. Featuring eight free public lectures, it will bring in guest speakers to talk about the concept of a museum from a wide variety of different perspectives. Dean Yager observed that he is finding UCSC arts alumni eager to reconnect with the campus and excited about participating in the future of the Arts Division.